The day of fiscal reckoning is coming, maybe? I am now under the belief that the New Brunswick provincial budget is in a structural deficit and we will not be able to grow or trim spending to get out of it. We will either need sizable new growth or new sources of tax revenue or big cuts or a combination of all three. New Brunswick’s share of the Equalization pie has dropped from 12 percent to 9 percent since 2006 and our share of total federal transfer payments from the federal government has dropped from 4.9 percent to 4 percent. That may not seem like a lot but if we still got 4.9 percent, it would have added roughly $560 million to our revenue which, incidentally, is just about our provincial budget deficit. Of course, Ontario needs it more than we do these days I guess. Anyway, we can’t expect the feds to bail us out – nor the Boomers. Note the following chart. Forgive the clunkiness of it but I’m not much of a graphic designer. The number of taxpayers under the age of 44 in the province is declining and the number of folks over the age of 55 is rising sharply and after the age of 65, the average taxpayer pays 45 percent less in income taxes than someone aged 45-54. So just when we need the bucks to beef up public health care the Feds and the Boomers are running for the Exit. So what do we do? You tell me. We really need to rebalance the taxpayer matrix – we need more young ‘uns to balance the old fogies (of which I am heading in said direction myself). Maybe we need to convince the feds to carve off a little more revenue from Saskatchewan, BC and Alberta shale gas proceeds to pay for our health care? Old Bernie Lord threatened to take the Feds to court to uphold his Constitutional Right to more Equalization. Maybe we will have to beg or sue our way to more revenue. I prefer economic growth but I’m not sure how may agree with me on this. Based on total income taxes paid (fed and prov). 5 Responses to The day of fiscal reckoning is coming, maybe? The problems seems to be rather macroeconomic. The fact that the Bank of Canada and other central banks around the world seem to think that their job is done even though some regions still have two digit unemployment and inflation is persistently under target is the source of our predicament. We have certain economic disadvantages especially when it comes to natural resources and this makes us disproportionately vulnerable to poor performance from central banks. New-Brunswick could afford much more of it’s government expenditures if more people had employment opportunities here instead of having to go to Alberta (and leaving their share of provincial debt behind). That is we don’t need more young, we need is more young _working_. Unfortunately the solution to this problem lies in our monetary system and seems to be somewhat beyond our reach. Locally what we need is more investment in business tools and infrastructure. If central banks are not willing to stimulate sufficiently, I wonder if it would be possible for the government to provide incentives. There are programs such as the Employer Wage Incentive but they seem to be designed for very short term effects. Once the program ends the employers can simply lay off the employee. Wouldn’t it be more efficient to offer business loan subsidies (mimicking the lower interest rates that central banks aren’t willing to provide) which could be used on durable new business equipment and infrastructure that support long term jobs. Or else something like a business rent subsidy, which would promote the development of more business space and buildings. These can’t be moved away so they imply certain commitments from businesses that build them or rent them and if they become vacant, they create a supply of cheap business space, incentives for the next employers to move in. It could also be subsidy on IT infrastructure, computers etc, with a restriction that they are not allowed to move out of the province. There are tons of way to do it that are better than paying 50% to 70% of new salaries for a short period of time. Well I bumped in this blog from twitter today and I now see that the themes of my previous comment have been discussed in depth around here. I probably didn’t add very much to the discussion. Benoit, I think your viewpoint is interesting. Feel free to add as you see fit. I don’t get a lot of comments on this blog anymore – everyone’s gone to Twitter. Any idea why the large bump in income taxes in 2008? Seems like an large bump. Was it all due to (debt-fuelled) stimulus spending? I think that it will be interesting to see what the numbers look like with the changes in personal income tax effective July 1st. The key is to get more people working in good paying jobs in order to generate tax revenue. Good paying jobs will stem outmigration and even grow the province. 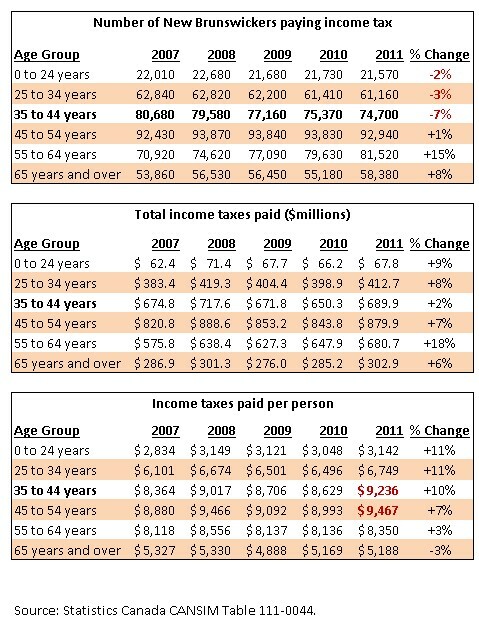 I find it interesting that the percentage of young New Brunswickers (under 34) paying income tax has gone done but the percentage of income tax they pay (and dollars) has gone up! Is this just another sign of income inequality? This blog links well with your October 12 TJ column on the social safety net. The inertia involved around any reconsideration of social policies appears to be enormous. I am one who thinks that Senator Hugh Segal’s campaign for a Guaranteed Annual Income (in some form to be discussed) is the appropriate approach. This will require a large army of motivators to inform the public about it’s benefits and convince civil servants and politicians that it won’t cost them their jobs. Perhaps this can be brainstormed at the 21Inc’s Ideas Festival?